Note: Some people spell it, "Go-Bots," and others insist upon, "Gobots." 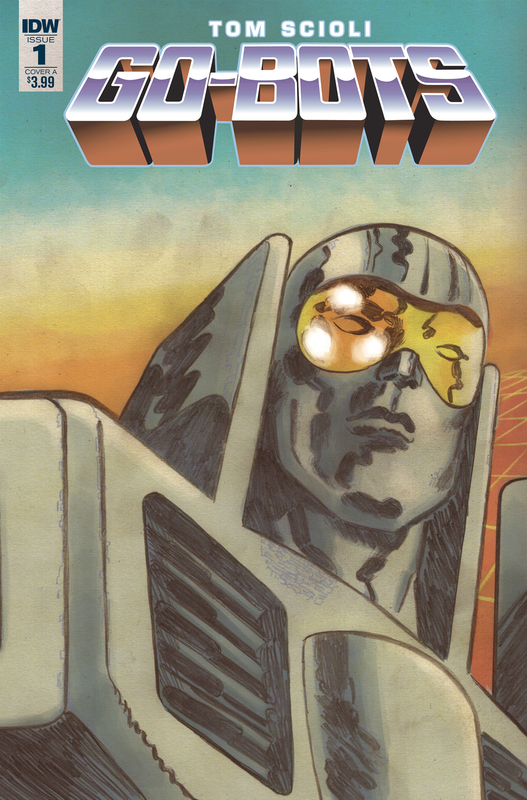 The comic is officially titled, "Go-Bots," so I shall refer to it as such in the article. Tom Scioli is a creator who knows how to make some stellar work. Whether he's doing his, "American Barbarian," comic, creating the magnum-opus which was, "Transformers VS G.I. Joe," or his latest project, "Go-Bots," his comic pages are a mixture of modern ingenuity with a nostalgic touch. I mean, the man hand-draws his art, colors it digitally, and then also hand-letters his work. There are not many hand-letterers in comics, let alone someone who does it all. Well, as he did with his, "Transformers VS G.I. Joe," comic for IDW, here Scioli brings us a his own unique take on another retro property, Go-Bots. Incorrectly assumed by some to be a Transformers rip-off, Go-Bots actually existed first, but as with many things that are the initial creation yet overshadowed by a later version (think Betamax and VHS), Go-Bots were kind of forgotten and/or outright mocked as a historical footnote--even once their rights were bought by the same company that owns the Transformer's license (Hasbro) and they were considered an alternate-universe of sorts of the Transformers...making them an, "Alternate," to an idea they were the original of, ouch. Here's the thing though, Tom Scioli doesn't care about any of the past baggage carried by Go-Bots. He says in the back-matter of the comic how he had an idea and this comic is an expression of that idea. It's a world where humans created Go-Bots so they could have a car that basically walked with them, but over some time the Go-Bots got so advanced they were used for everything from warfare to medicine to NASCAR-esque racing, and even underground fight-rings. They are programmed to almost never be able to hurt a human, but some defy this through various means (both allowed or illicit). 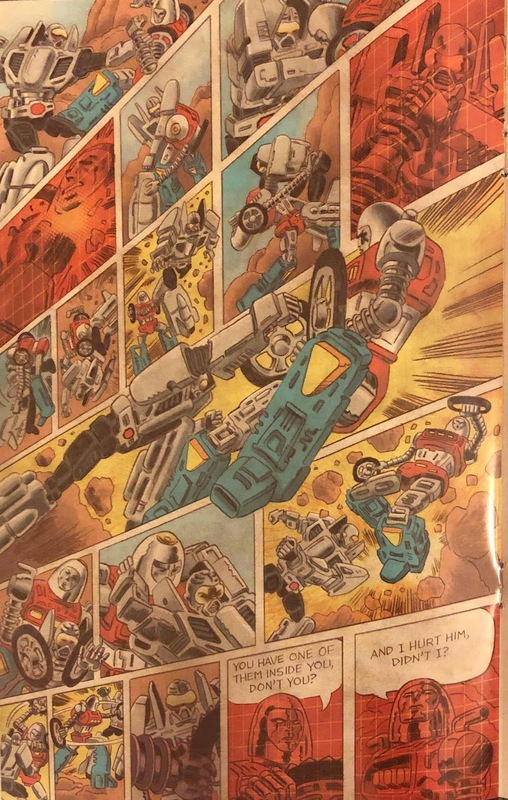 The, "Go-Bots," comic introduces us to an assortment of characters and leads-up to an evil Go-Bot and his ilk turning off any safeguards in Go-Bots, allowing them to rebel and hurt/kill any human if they so choose. It's a regular-length comic yet it feels absolutely jam-packed with the goodness of a super-sized book. Scioli is a master of the comic-page. He can fill the space with many small panels, a big splash-page, or completely change the format from more grid-based to curving on the page as if to represent the speed in a scene, as the image up above shows. He jumps around to a number of stories but it feels like they all get to breathe, whether its a military Go-Bot and its operator, a famous racing Go-Bot and its self-absorbed driver, or a peppy commuter-focused Go-Bot with a young woman who rides it. Within this first issue the stories of everyone unfold in a way both isolated yet clearly interconnected in an assortment of ways. Plus, good God is everything just so gorgeous. Scioli's artwork makes you feel like the vintage toys have come to life through his art and it is simply astounding to witness. Scioli is a creator whose talent cannot be overstated in the least. 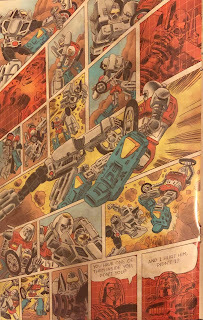 This first issue of, "Go-Bots," is spectacular (like much of Scioli's work) and I know Scioli will continue to impress with all the upcoming issues as he gives us a, "Go-Bot," story worthy of their status as the original transforming robots. Between an intriguing plot and his usual jaw-dropping artwork, Tom Scioli has done it again, and boy-howdy does, "It," always impress with him. I without question rate this comic 5 out of 5 stars and urge you to get to your newest comic shop to purchase a copy, as it is officially out today (with the Local Comic Shop edition having come out this previous Saturday, thereby giving some readers a head-start on ogling the gorgeous book). Seriously. regardless of if you've ever even heard of the Go-Bots you'll most likely love this comic, I know I did.